The neighborhood of Alphabet City is not known for its curb appeal. The intermittent vibrant, green community garden or eclectic specialty bar breaks up an otherwise drab span of decades-old apartment buildings, dimly-lit bodegas, and vacant retail spaces plastered with “For Rent” signs. Nestled in the heart of the community, between Tompkins Square Park and La Plaza Cultural, a community garden, a desolate, dilapidated structure epitomizes this state. Cracks run up the tall, but crumbling, red brick walls and the spacious concrete terrace that served as an entry-way is boarded up with scaffolding and poster-plastered plywood. This is Public School 64, and it has been sitting here, empty, for almost 20 years. After a reportedly “concerning” crack forced the evacuation of neighboring buildings earlier this month, the current owner and the community are calling for an end to the standoff that has prevented development on the site for so long. Jason Goodrow has lived in a building adjoining PS 64 for 27 years and was among those forced to evacuate in early March. Before it was a cracking, boarded-up shell, the former school building was used as a community center of sorts. Rooms were rented out to organizations for meetings, dance companies for rehearsal space, and NYU film students for movie screenings. Then, in 1998, the city held a public auction and sold the 111,000 square ft property to Gregg Singer. According to Singer, he attempted to keep the building functioning as a community center. He rented the entire building to the same tenant who had held a short-term lease with the city before Singer purchased PS 64, but the relationship turned out to be unsustainable due what Singer says was illegal renting activity. 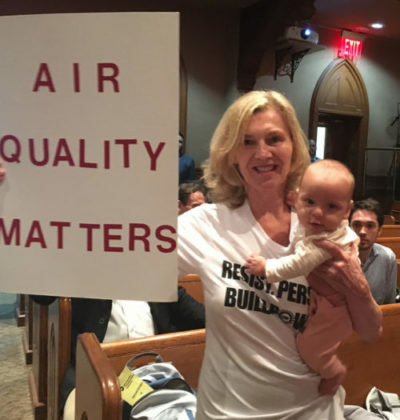 Soon after evicting the tenant, Singer began developing a plan to convert the building into a student residence, but was met with backlash from the community and city officials. Goodrow described some of the issues he has had to face for almost two decades now. The scaffolding that surrounds the building makes natural cleaning of the sidewalk impossible. Though he is not a fan of Singer, he readily admitted he is ready for the issue to be resolved. He also pointed out that others in the community have voiced support for Singer’s dormitory, especially those who own businesses in the area. Just two blocks up the street from PS 64, Gregg Singer peered over his photochromic lenses to blow on his cup of coffee. In a sweater, scarf, and fancy leather shoes, he looked the part of a wealthy real-estate developer. Like Goodrow, he pointed out the potential benefit to businesses in the area. 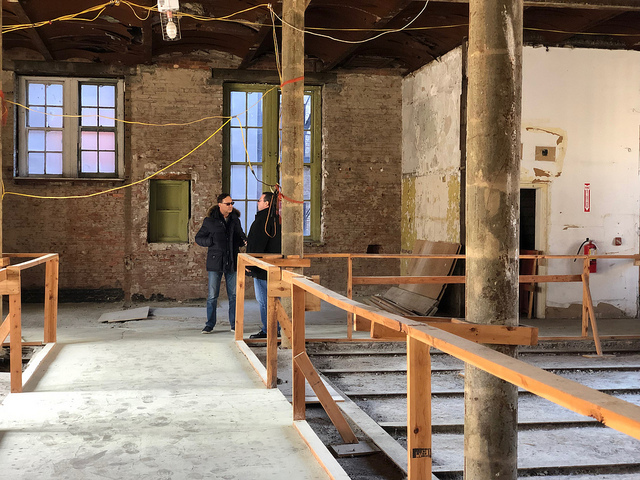 PS 64 owner Gregg Singer, and his attorney David Schwartz, stand in the demolished foyer of PS 64, discussing the potential the building holds. Photo by Samantha Springer. In 2008, Singer circulated a petition of agreement to the renovation to businesses in the area and compiled over 600 signatures. In 2017, he pulled more than 1500 from members of the community. Both Goodrow and Singer are under the impression that the entire fight is a facade for shady government dealings, but each accused the other side of being the one with dirty hands. Goodrow said he thought Singer might have made a “backhanded deal with Giuliani” and Singer accused the De Blasio administration and local council members of taking payments from another developer. While the governments real role can only be speculated at this point, there is no question that Singer has been cast in a villainous role in this situation. “They think I’m the bad guy,” said Singer, but his attorney, David Schwartz, said it’s not a personal vendetta, anyone who bought the building would have ended up in the same boat. Singer stood in the hollowed out belly of the building, and looked around. The sunlight filtered in in through large dusty windows, illuminating the space. 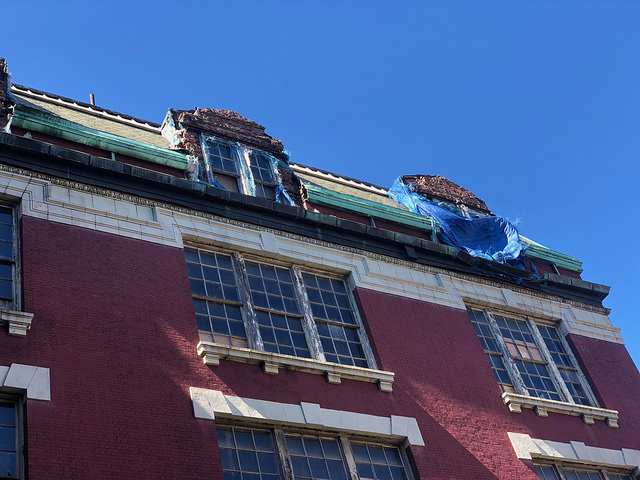 Singer has a case pending in federal court, but until a ruling is made or an agreement is reached, PS 64 will continue to stand empty, a haunting eyesore on the streets of Alphabet City.